Voice of the Town choirs perform some of the very best songs from a range of different styles, including Soul/Funk, Gospel, Pop/Rock, Dance and RnB. We’re known for our funky, modern vocal arrangements and rich harmonies, often four or five-part (all of which are written by us), as well as our dynamic, expressive, energy-filled performances. We’re available for all types of events and artist support/recording. You’ll be led by one of our top industry Musical Directors, who themselves are professional vocalists, vocal coaches and MDs and have worked with major artists and celebrities. As such, you’ll receive top tips and advice on how to improve your voice even further. Our groups are perfect for anyone who can sing out confidently with good pitch, are willing to perform with expression, are willing to practice their parts, who want to get involved in exciting shows and are up for a challenge. There are no auditions and you don’t need to understand sheet music either. And… we don’t do huge groups or have lots of different ones in the same location – so you won’t just be a face in the crowd. 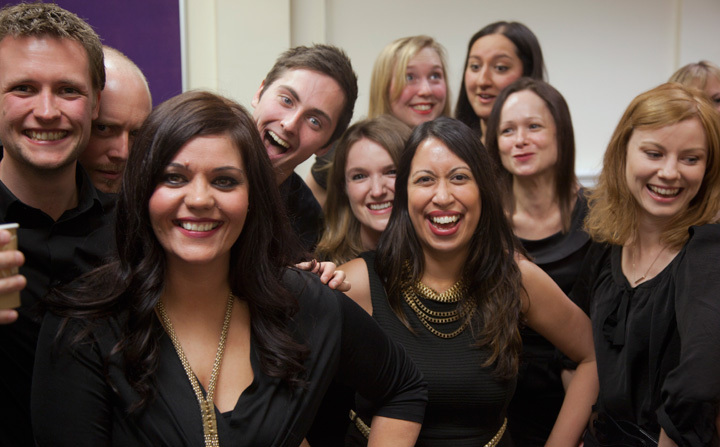 Formed in 2011, VOTT is a performance choir for people who like more of a vocal harmony challenge, who are willing to sing out confidently and want to be involved in a dynamic group which gives people the chance to sing at a wide range of events. And so far, our members have appeared on BBC television, as part of the pro UK tour of Godspell, at Glasgow’s Commonwealth Games, recorded a charity single with a Britain’s Got Talent winner, backed artists such as Russell Watson, G4 and Susan Boyle, and toured with stars of Strictly Come Dancing at some of the UK’s most iconic venues.